File the edge of your nail at a 45°angle. File in one direction towards the centre. Don’t file too deeply at the sides. 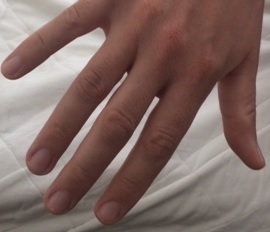 A man’s nails should show a semicircle of white nail ¼ inch beyond the fingertip. You can use scissors if you like but your nails will still need to be rounded off with a file. Brush your nails and hands with the nail brush and make sure your nails get a good scrub. Dry your hands and push back the cuticles with the towel. Then use the orange stick to get underneath them to remove any of the old dry skin stuck to the nail. You can rub a lemon over your nails to get rid of stains or use a Pumice stone. You can apply an exfoliator or scrub all over your hands and then wash off to make them soft and very smooth. Use the Orange stick to clean underneath your nails.uff them to make them shine as it smoothes out the surface of the nail. Buff the nails making sure you only buff in one direction otherwise your nails can get too hot. You can then apply a Base Coat to protect your nails or if it looks to shiny wipe it off immediately with a cotton pad so that your nails just look healthier. Apply a hand cream if you like to finish it off and wipe off the excess with a towel. There are lots of treatments that you can apply to keep your nails looking good. Essie make a cuticle oil which you paint on and let dry. I really like using that. It is not shiny it just dries in. The more it dries in then the more you need so apply it every day until your cuticles and skin around your nails are nice and soft. Leighton Denny makes my favourite products. He was a Fireman before he went into the Nail Industry.